The Rocket Garden at the Kennedy Space Center. My husband, the NASA engineer, was recently honored for his achievements. The award was presented to him at a breakfast on what was to be Space Shuttle Endeavour's last voyage. But by now I'm sure you've all heard that there was a problem with the thermostat of the auxiliary power unit, and the launch had to be postponed; a tentative launch date has been set for May 16th. Storm clouds move into Cocoa Beach, Fl on April 28th 2011. 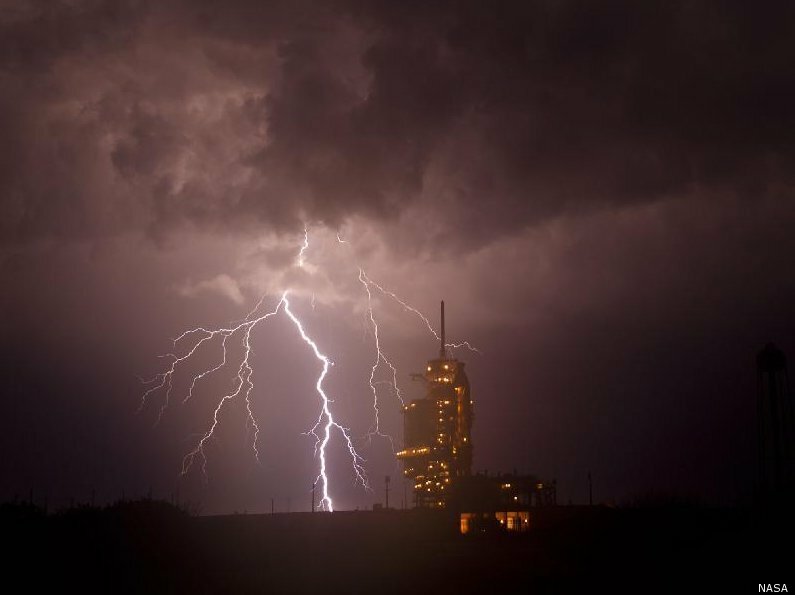 Lightning strikes pad 39A. Image by NASA/Bill Ingalls. The morning of the 29th broke cloudy, wet, and windy; and though the rain and clouds cleared by midday, the winds remained a strong 20 mph, well above the safe 12 mph launch requirement and even the 17 mph waiver. So even before we knew of the technical difficulties, we were cautious in our optimism. The crowds starting to form early in the morning along the beach. But optimistic we were, and we cheered for the astronauts (Mark Kelly, Gregory Johnson, Michael Fincke, Greg Chamitoff, Andrew Feustel, and Roberto Vittori) as they drove by in their silver "Astrovan". It was at that particular moment that the launch postponement was announced and the Astrovan had to sadly retrace its steps. The astronauts met with President Obama, who had come to watch the launch, and the rest of us went to drown our sorrows in the Atlantic Ocean. Cocoa Beach, Florida. April 29th, 2011. The Vehicle Assembly Building, where the Shuttles are serviced and prepared for the Missions. Endeavour in the distance. This is as close as a normal tour gets, and on a normal tour the Shuttles would be safely parked in their respective hangars. "The Crawler". This is the vehicle used to transport the Shuttle from the VAB to the launching pad. Every shuttle gets its own building. Notice the slot in the middle, that is to make room for the shuttle's tail as it drives in and out. The Vehicle Assembly Building from another angle. The big door is where the shuttle exits, rocket boosters and all. The "VAB" is 525 feet tall and 210 feet wide. Simple in design, it requires a complex ventilation system to avoid condensation and rain clouds from forming inside the building. Space Shuttle Endeavour on Pad 39A, ready to launch (or not...). Sadly our obligations prevent us from returning to Cape Canaveral for the next launch attempt; but hereby I wish the crew of STS-134 safe travels to the International Space Station on May 16th at 8:56 am! Go Endeavour! What an amazing and informative post. Although the day was tinged with disappointment, nonetheless there was clearly so much of interest. We hope that all will be well for May 10th.